Tourists and London residents alike are going to love visiting Social Fun & Games Club this summer, the perfect place to relax, have some tasty food and play a round of mini golf. Located on a stunning rooftop in Stratford, pull up a deck chair, grab yourself a cocktail and admire the panoramic view of the London skyline. If you hang around long enough, you’ll even get to witness a gorgeous sunset and be able to take some picturesque photos during the coveted golden hour. Aside from the great view and Insta content, Social Fun & Games Club has loads of fun activities to take part in. Themed like a carnival, you can play some fun mini golf, play a competitive game of ‘De La Bowls’ or test your reaction timing in the batting cages. Rooftop Film Club can also be found here, with a mixture of classic and new release movies showing. Click here to see what’s showing next. A funky burger joint sells juicy cheeseburgers and classic British fish and chips, both separately and together. 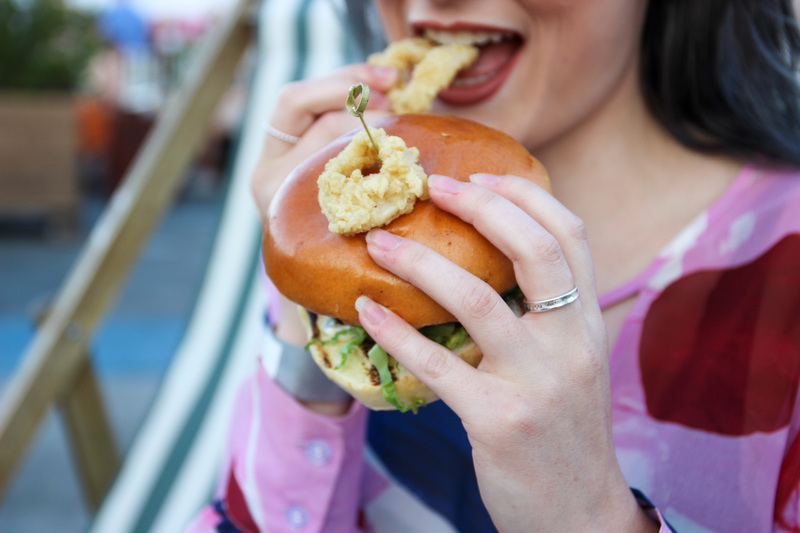 Try the Surf ‘n’ Turf burger for a fun mix of land and sea colliding in one bun. Tacos are also available to buy from the next stall over for those who want a little fire in their bellies. Bars dotted around the rooftop sell everything from beers to cocktails, ensuring there’s something for everyone. If you’re visiting with a group of friends, go for one of the cocktail pitchers, grab a table and watch the activities whirling around you. Social Fun & Games Club thoughtfully has free entry, and once you’re in you can buy tokens for the games. To see how our first experience at Social Fun & Games Club was and watch us become the worst mini golf players in the world, head to our IGTV here.